Now for something different. 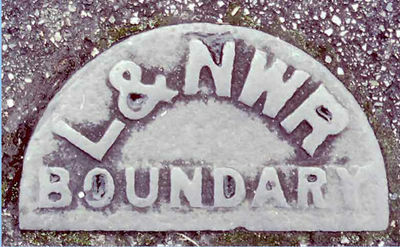 A LNWR boundary marker at Newton-le-Williows. It is set into the pavement at the bottom of the steps that leads from the station onto the main A39 near the 1829 built viaduct. When could have been put there? Was their use widespread? Are there many left? Boundary posts and markers were used where it was impractical to fence the railway as is required by Statute. Often they were used when land was acquired for subsequent widening of the railway that never progressed. With there already being a fence on the original boundary, although not strictly compliant with the legal requirement, there was not much point in providing fencing for the later acquired land. It is all about not loosing possession of the unfenced land; marking the extent of the land in the Railway Company�s ownership. The land outside the fence would generally be let to the adjoining owner. At Newton-le-Willows it is clearly not practical to use posts, hence the markers in the pavement. Here, the Railway Company would be keen to ensure that the local Authority was aware of the limit of the LNWR ownership and thus liability for maintenance etc. The pavement markers are not so common but you�ll still find quite a few LNW boundary posts around, if you know where to look. A number can be seen from the train located on the up side road approach of the overbridge at Goostrey. As regards when the ones would be placed at Newton-le Willows; well there is a fair chance it was because of a dispute with the local Authority. As a member of the public the �easy� course may be to start with the records for the local authority. It is likely that there may be a record shown on the plans showing land ownership inherited by Network Rail from BR or the former Railway Companies but it is unlikely any correspondence remains. There were a few knocking about that I have come across around Newton le Willows. The one at Winwick Junction, had been dug up by a tractor and it was about 5ft long! My first thought was “I will take that home” but as I could not even budge it from the mound of earth even with the leverage, I left it. There used to be either a mile post or a boundary post at the side of the Sankey Viaduct. There are 2 of these cast iron posts still extant around Carr Mill dam at St.Helens. They were placed after the widening of the dam toward the end of the 19th century. The LNWR apparently had water extraction rights from the dam which was originally a feeder for the St.Helens – Widnes canal. Another post also exists at the Blackbrook canal basin of the St.Helens – Widnes canal but the last time I saw it, around 1993, it was in danger of being covered by silt during dredging of the basin. The posts are of T-section and the cast iron is approx., 5/8in thick: if they are 5ft long (probably with a concreted base) then I would imagine the weight would preclude casual removal. I came across a Boundary Post when doing some research for a DVD. The post was made of cast iron, about four feet in length, tombstone shaped and covered in rust. It was discovered in the Wigan area in between Brock Mill and Haigh junctions on the dismantled L.N.W.R and L.U.R joint line. To make the inscription more readable on the DVD, we went over the writing with a POLO mint!! There is a similar boundary marker in Bolton-le-Sands, near Carnforth, at around grid ref SD483677. This is quite some distance from the LNWR's main line, about 600 yards away, on the other side of the A6 and a small hill. It's presence is due to the fact that the Lancaster Canal was eventually the property of the LNWR (as detailed in the Glossary under Lancaster & Preston Junction Railway). It's still there set into the pavement as the St Michaels Lane climbs to cross the canal on it's way into the village. It's the only LNWR marker I know of in this area. There is a photo of the Bolton-le-Sands boundary marker here. There is a similar one at Glasson Dock (SD445561), and finally there is a boundary post on the south side of the Lancaster Canal at Crag Bank (SD492695).